Life and growth happen best in circles and not lines. Have you heard this before? This is just one way of saying that groups are important. We believe that life is better when shared with others! Growth, care, encouragement, and inspiration are all part of group life. We have three types of groups that meet in various places and in various ways: life groups, ministry teams, and interest groups. Life Groups meet reguarlary and usually in homes to discuss a topic of choice or questions from the Sunday Talk. Ministry Teams are groups that are focused on an area of ministry together. 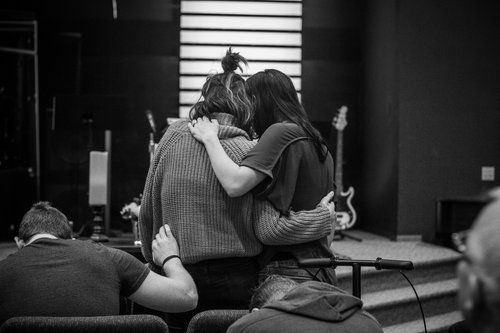 Prayer, team meetings, and growth are all part of being on a ministry team. Interest Groups vary depending on the leader, the season, and the interest. Ready to connect on a deeper level? Ready to grow? Ready to share life with others? Below are some ideas on how to find your place. Sign-up for a group on our App. Reach out to our Group Connect Leaders. Sign-up for a group on Sunday at our Connection Hub. Can I join a group at any time? Yes, our groups are designed to be inclusive and welcoming, though some groups may be fuller than others. We would love to help you find a group that is a good fit for you (and your family). What is the emphasis of the groups? The emphasis is dependent upon the direction of the group. Many of our groups focus on the talk from the previous Sunday, while other groups may do a dvd or book studies. Do I have to bring anything to the group? No, but most of our groups do share a meal together. Once you find a group fit, you can participate. Are the groups family friendly? Most likely. Check the group description and time to find one that best fits your family's schedule. I have been attending Harbor Life for a while, now what? Get connected. Join a group today! We'd love to get you connected to a small group. Fill out the form below to get started. Small groups help people grow in their faith and build community. We'd love to have you join us!